The Vacuum Store has been family owned and operated in western Maryland since 1979. The owner Robert Scott Shirey started working for the Vacuum Store in 1979 and then purchased the Frederick location in 1983. 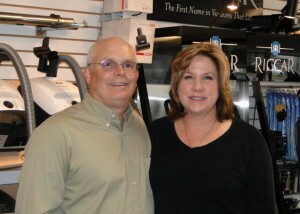 Scott and Linda Shirey then opened the Hagerstown location in 1992. The Shirey’s and their employees offer PERSONAL SERVICE – EXPERT ADVICE and QUALITY REPAIRS. We carry an extensive line of vacuums to fit all budgets. Please come see us for uprights, canisters, lightweights, central vacuums, commercial vacuums, accessories, vacuum scents, parts and bags. We also carry floor care products such as steam cleaners, polishers and dry rug cleaning equipment. Also offered are air purifiers and we are proud to say we carry Vacuums MADE IN THE USA and imports with metal motors. We have carefully chosen machines that hold up to our standards and testing. Most vacuums do not filter the air the way manufactures claim. We have sorted out the machines for you and have found the ones that do clean and filter the air the way they should. We care about the product we sell and stand behind them. Two locations to serve you! Come see us! In Frederick –Scott & Linda Shirey, Ralph Sterling and Carlos Gomez. In Hagerstown—Scott & Linda Shirey and Sean Shirey.